Stanley Bray is a not so typical Cornish farmer who lives with his housebound wife Joy. For nearly thirty years, Joy has been waiting desperately for the return of their son, who had mysteriously disappeared. As the thirty year anniversary of his disappearance looms, Stanley begins to hang Donkeys. Yes. Donkeys. 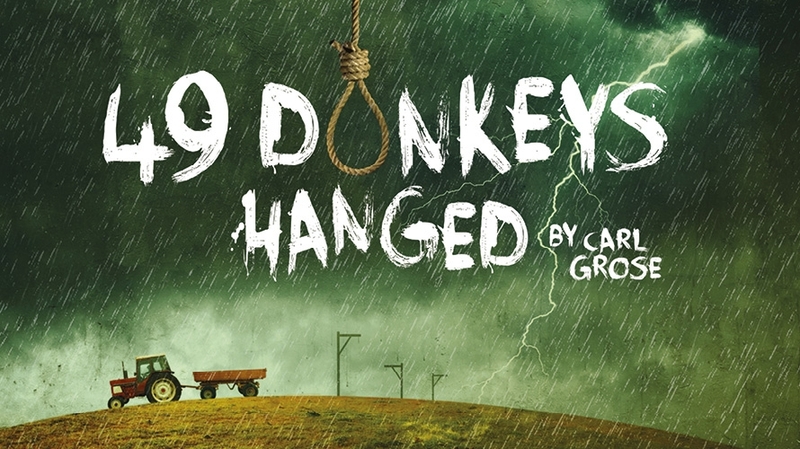 49 Donkeys Hanged, produced by the Theatre Royal Plymouth, is a bizarre clash of cultures, reality and imagination. The story line is based on a real newspaper article found near Johannesburg by playwright Carl Grose (who is also a character in the play but is played by William Hartley). The headline stated: 49 DONKEYS HANGED but the article explained very little detail about why farmer Solomon Singo had killed so many donkeys. This sparked a range of questions in Grose’s mind, much like my own experience when watching this production. So why is the play set in Cornwall? I’m not really sure, but somehow it seemed to make sense. With the hilariously blunt husband-wife relationship between Stanley (Ed Gaughan) and Joy (Veronica Roberts), bickering with their west country accents, the whole scenario seemed much more familiar to me. Why are Donkeys being hanged? I don’t know the answer to that either, and neither does Stanley Bray. However, there is definitely something striking about the image of 49 donkey-shaped cuddly toys being strung up by their necks without any real explanation. This donkey hanging mystery made the audience seem hooked on every word from Stanley’s mouth throughout the promenade performance. Eager to find the answers, they were compelled to physically follow the characters as they passed through the audience to each new scene. One magnificent part of the set was revealed at the introduction of Slaughterhouse Sally (Buffy Davis), who seemed to be a central character for the many plot twists in the production. Set at her place of work, an eerie soundscape of machinery and sharp metal was enough to depict an abattoir. Then suddenly, bright lights shone upon a platform above the audience to reveal a full size (model) cow carcass hanging from the ceiling. Sally, sporting a blood stained apron began to pull out a bloody heart while in full conversation with Stanley. The multiple components of this scene were equally shocking and brilliant which made me crave for more moments with this effect; which I believe some scenes had the potential to have. The whole plot and donkey hanging business may seem somewhat confusing. But fear not, the real Carl Grose has written that character Carl Grose was kidnapped by Stanley from his home in Truro. Character Grose explains the lack of answers; the end of the play hasn’t been written yet in the actual play, but it has been in real life. To find these answers you’re just going to have to watch the play. Simple. I left The Drum with endless questions, and I’m still not entirely sure of all the answers but I cannot deny 49 Donkeys Hanged left me incredibly entertained.